How to account for the fun factor when assessing wine? 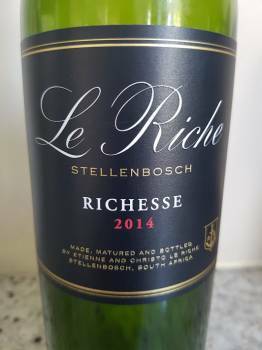 The Richesse 2014 from Stellenbosch cellar sees Cinsaut included in a wine that was previously a conventional Bordeaux-style red blend, the specific composition being 27% Cabernet Sauvignon, 24% Merlot, 18% Petit Verdot, 13% Cabernet Franc, 12% Cinsaut and 6% Malbec, maturation lasting 18 months in French oak. The nose shows red and black fruit, olive, the vaguest hint of fynbos and attractive oak. The palate shows pure fruit, bright acidity and fine tannins. It’s really skillfully put together – not as severe as some Bordeaux-style blends but equally not as incidental as some Swartland reds. Forward in style but by no means entirely frivolous, an absolute pleasure to drink. Wine Cellar price: R135 a bottle.